Paris events during July include some of the year's most exciting things to do and see: the Tour de France bicycle race finishes with a flourish down the Champs-Élysées, city beaches complete with sand and palm trees pop up next to the Seine River, and Bastille Day fireworks at the Eiffel Tower lights up the night skies. And that's just the beginning of the exciting events in July - many of them free and outdoors, taking advantage of the glorious July weather. You can drop in on a Fireman's Ball for some pre-Bastille Day celebration, catch the famous summer sales, and perhaps spot a few models from Paris Fashion Week - Haute Couture takes place in July. You'll also find free outdoor film festivals, concerts, and art shows. 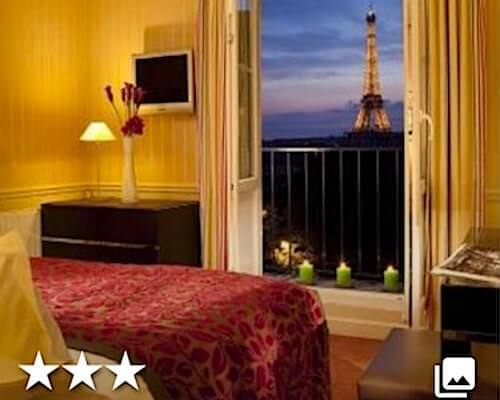 Get ready to have a spectacular time in the City of Lights, and enjoy the long sunny days and fun things to do that makes July one of the best months for visiting Paris. Bastille Day, the biggest Paris summer holiday and a national celebration throughout France, always takes place on July 14, the anniversary of the storming of the infamous Bastille prison in 1789 - a turning point in the French Revolution. The day starts with a huge military parade down the Champs-Élysées from the Arc de Triomphe to the Place de la Concorde including a flyover of military aircraft that you can see from most points in the city. A special tribute will be given to the United States this year to commemorate the 100-year anniversary of our entry into World War I. Military ceremonies begin at 10am, the flyover takes place at about 10:45am, and the parade kicks off at 11am, and lasts almost an hour. 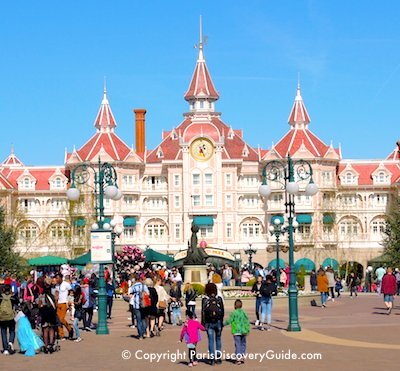 Arrive early if you want to stake out a good viewing location along the Champs Élysées. 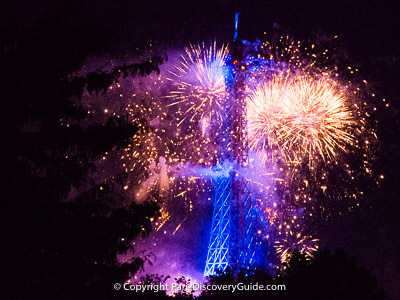 A spectacular fireworks show at the Eiffel Tower on the Champ de Mars begins at 11pm, and lasts about half an hour. Gather on the Champ de Mars with a blanket and picnic from noon on to relax and enjoy free concerts, including an opera under Tour Eiffel beginning at 9:30pm. More to Enjoy: Firemen's Balls (see next July event) at the fire station in each Paris district (arrondissement) on July 13th or 14th. 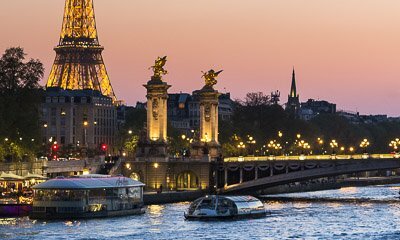 Another popular choice is the Bateaux Parisiens Dinner Cruise on the Seine, which includes pickup and dropoff at your hotel. 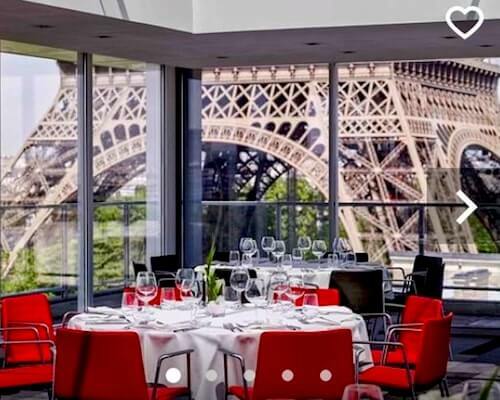 You'll enjoy a 3-hour Seine River cruise, a 3-course dinner with wine, live music, and panoramic views of the Eiffel Tower and other famous landmarks. Available every evening - but book far ahead for Bastille Day. 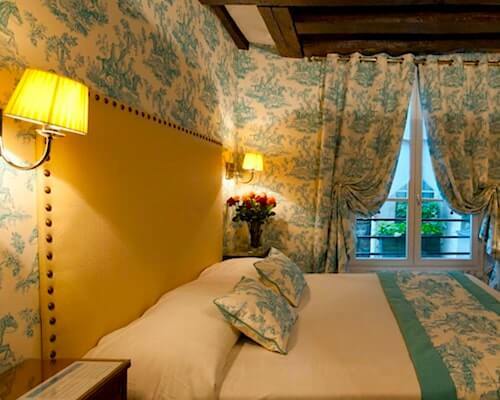 Want to celebrate Bastille Day like a true Parisian? Attend one or more of the Firemen's Balls- Bals des Pompiers - held on July 13th and/or 14th as the main fire house in each Paris arrondissement (district) opens its barracks and courtyards and welcomes the public for an all-night party with music, dancing, and drinking Champagne or beer. The Bals des Pompiers start at 9pm and end at 4am. Depending on the fire house, they take place on July 13 or July 14 - and in a few cases, on both dates. Find out more about what to expect at the Bals des Pompiers, locations, and date(s) for each firehouse. The famous Tour de France bicycle race - 23 days and 2,000 miles (3,540 kilometers) long - comes to an exciting close in Paris on Sunday, July 28. Arrival time in Paris is hard to predict and varies every year, but somewhere between 3:30 and 5:30 is a reasonable guess. The final Paris stretch includes 10 laps up and down Champs-Élysées and around the Tuileries Garden - which gives you plenty of chances to see the racers. 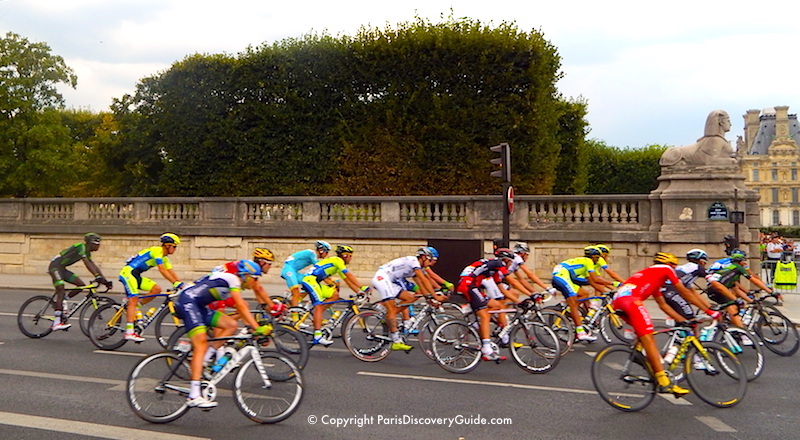 You can watch the race anywhere along this route, but viewing areas along Champs-Élysées fill up quickly due to barriers keeping you back from the street and "privitized" areas used for outdoor dining by restaurants and other businesses. Tuileries Garden and areas on the other side of surrounding streets are usually somewhat less crowded, and especially if you get there early, you can usually find a good place. Keep in mind that most metro stations along and near the route will be closed for much of the day, and city buses will be re-routed. 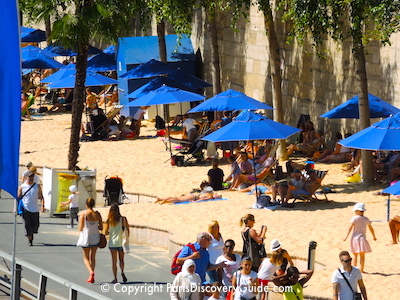 Paris Plages ("Paris Beaches") transforms parts of Paris into fun-filled beaches each summer. You'll find Paris Plages at several main locations: Both the Left and Right Banks of the Parc Rives de Seine where deck chairs, umbrellas, sand, grass, and palm trees line both sides of the river, the Esplanade in front of City Hall, and La Villette Canal Basin in the 19th arrondissement where you can float in the huge Paris Plages swimming pools as well as enjoy canoeing, other water sports, and even a zipline along the Quai de Loire. 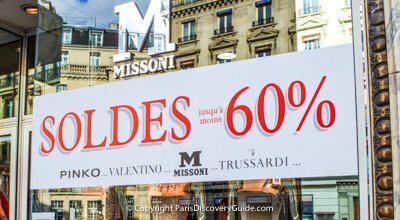 Look for Soldes signs in store windows all over the city, often followed by the amount of the reduction - typically 30-40% at the beginning, and soaring as high as 70-80% at toward the end. Best places to find bargains? Everywhere! Luxury labels such as Chanel, Valentino, and Armani draw huge crowds - ditto for Galeries Lafayette, BHV, Bon Marché, and Au Printemps - but don't ignore smaller boutiques and even global mid-market chains. As usual, coveted Hermès bags, shoes, clothing, and other goodies go on sale for only 2 days this time - June 26 (9am-8:30pm) and June 27 (9am-6pm) (dates/times to be confirmed closer to event) offsite at Palais de Congrès near Porte Maillot. Haute Couture Fashion Week takes place in Paris from June 30 - July 4 for designers to present their latest high fashion collections. The best places to catch a glimpse of the models (assuming you're not going to the invitation-only shows) are near the venue locations - the Grand Palais in the ritzy 8th arrondissement near the ornate Pont Alexandre III bridge, Espace Eiffel near the Branly Museum on the other side of the Seine, and at a variety of smaller, hipper venues scattered around the city such as Palais de Tokyo and Musée Galliera in the 16th. The trendy Marais neighborhood, especially around Place des Vosges, and Palais Royal (shown in photo) are always good model-spotting locations. 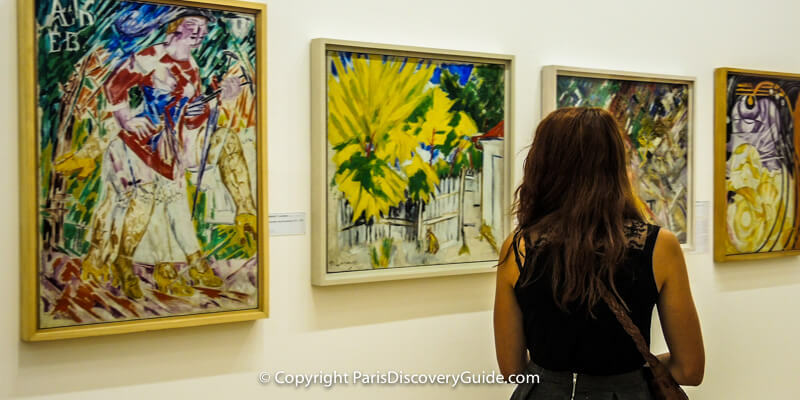 Want a fun excuse to explore different Paris neighborhood while celebrating summer in the city? 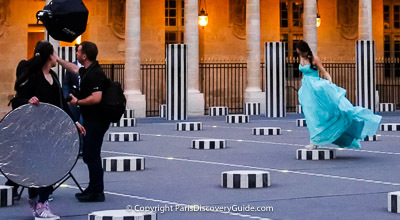 The annual Paris l'Été Festival (Paris SummerFestival) offers free or inexpensive outdoor music, dance, circus, and performances in all parts of the city, often in unusual places - more than 70 events in 30 different locations. - and celebrates the city's cultural diversity while mixing avant-garde/off-beat events with more mainstream traditions. The festival runs from July 16 - August 4. 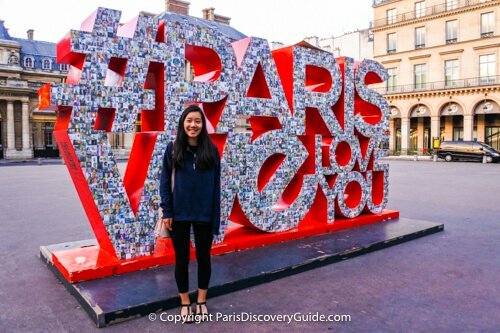 Check Paris l'Été for schedule details. 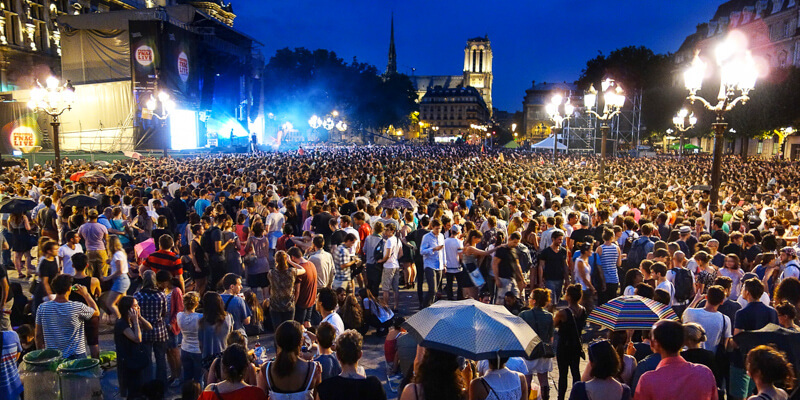 Don't miss three days of free live concerts by 30+ artists in front of Hôtel de Ville (Paris's City Hall) from 5pm - midnight on July 4, 5, 6 by contemporary French musicians as part of the big Paris Plages (beaches) summer event. Concerts are sponsored by French electronic retail chain Fnac (you'll see branch locations all over Paris) and usually attract around 100,000 fans. Location: Place de Hôtel de Ville, 4th arrondissement. Jazz concerts take place every Saturday and Sunday for 4 weekends at Parc Floral (the Paris Botanical Garden) in Bois de Vincennes through July 22. Bring a blanket and a picnic or buy wine and a sandwich at the park's snack bar, and get ready for a relaxing afternoon and evening enjoying the sunshine, flowers, wandering peacocks, and virtuoso jazz. Concerts are free, although the park charges a small (2.50€) entrance fee during summer and early fall. Check the Festival's website for concert times and - they vary each weekend - but generally take place in the afternoon and early evening. Getting there: Bois de Vincennes, located in 12th Arrondissement on the eastern edge of Paris, is easy to reach - just hop on RER A train or Metro Line 1 to the Chateau de Vincennes Metro Station - the park is about a 3-minute walk from the station. Bonus idea: Arrive early and stroll through Parc Floral's famous gardens, or explore Bois de Vincennes' other attractions such as its spectacular zoo, Lac Daumesnil, the aquarium, and 14th century Château de Vincennes. Free outdoor movies return to Parc de la Villette again this summer for the Cinéma en Plein Air. Bring a blanket to sit on, or rent a folding chair for 7€, or 5 folding chairs for 20€. Movie selections feature a theme each year - and this year's theme is singing! @ Centre Pompidou, through Dec 30, 2019 - The new presentation of Contemporary Collections on the 4th floor features large installations from the late '60s including works by Dubuffet, Bruce Nauman, Guy Cointets, Louise Bourgeois, Mike Kelley, and more. Included with general admission of 14€. @ Musée Yves Saint Laurent, Through December 31, 2019 - This new presentation of the museum's permanent collection features trend-setting designs in the famous fashion designer's 16th arrondissement former haute couture workshop. Tickets 10€; open Tuesday - Sunday 11am-6pm (until 9pm on Fridays). @ The Grand Hall at Parc de la Villette, May 15 - September 9 - An immersive experience at the frontiers of art, science, and technology. Open daily 10am-7pm, and Saturday until 10pm (last admission at 8:30pm). Tickets 14.90€. 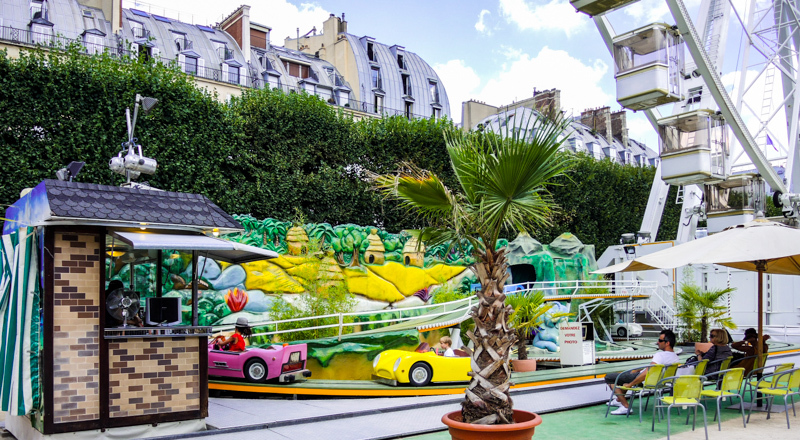 La Fête Foraine des Tuileries - literally, a "Fun Fair," or carnival - suddenly pops up in Paris's Tuileries Garden toward the end of June for two months of non-stop entertainment. With a giant ferris wheel (hint: bring your camera for great shots of Sacre Coeur and the Eiffel Tower), carousels, bumper cars, gut-wrenching rides for thrill seekers, children's games, and a lot more, the carnival entertains families with kids, teens, and everyone else seeking fun throughout the rest of the summer. If you're visiting Paris, combine a stroll through Tuileries Garden and the Fête Foraine with a visit to other nearby attractions: the treasure-filled Louvre, Monet's giant Water Lily paintings at Musée de l'Orangerie at the opposite corner of the garden, and the Carrousel du Louvre underground shopping center next to the Tuileries metro station. Firemen's Balls - Find out more about these fun Bastille Day (and Bastille Day Eve) parties! 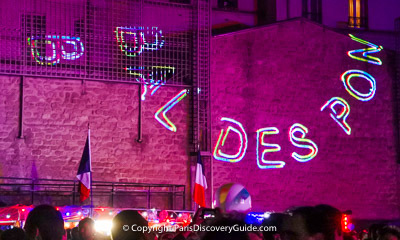 Bastille Day in Paris - Parade, Eiffel Tower fireworks, and parties!